Check out these amazing DIY easter decorations! They make for a fun and creative project for your kids to try (with parental help of course!). 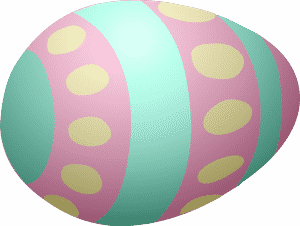 is making Easter egg creatures. Kids can make anything from cows to pigs and birds to bunnies; really, just make whatever they can think of! First, you will want to start with an animal template. Make a list of what your kids want to create. Then head to your local craft store and get a few things. A variety of different color felt, crepe paper, yarn, thread, glue, and pipe cleaners should be all you need to make your Easter barnyard come to life. Be sure to ask your kids how they want to decorate. Keeping them involved throughout the entire process will make the project that much more meaningful for them! After you have your materials begin to cut out your animal shapes. Beaks for birds, whiskers for cats and dogs, pipe cleaners for arms and legs, etc. Be creative! Once you have your templates you’re ready to start making your egg creatures! When shopping for eggs try to get a variety. A Quail easter egg (you will have to get these at specialty stores) is awesome for making smaller animals. However you might have to use paint instead of dye as quail eggs have spotted shells. Brown eggs are favorable for animals with dark fur or feathers. 1) Empty the contents of your eggs that way you can save your creations if you want. Pierce the one end of the egg with the utility knife, making a hole about a 1/4 in diameter. Whichever end you choose to make the hole is up to you depending on how you are going to decorate it. Poke a paper clip in and stir the yolk. Use the syringe to remove if the yolk will not pour out completely on its own. 2) Cover the work area with rags or paper towels. Mix the dye in a jar and submerge the egg (you can keep the egg down by filling a paper cup and placing it over the egg in the jar). Soak for 5 minutes for lighter colors and 10 minutes for darker ones. Remove the egg from the jar using tongs and place them on a clean surface to dry. 3) Make sure that the dye or paint is completely dry. Attach animal features with glue and let dry for 20 minutes. Add small details like eyes with fine paint brush or marker. Then glue on feet and legs. And your DIY Easter decorations are finished! Now you and your children have a great Easter animal setting that you can enjoy for the holiday and beyond!